In this video, a valve maker demonstrates a lean U-shaped work cell, consisting of three machining centres. Each station machines a different section of the same part, instead of one operator making the entire part at one machine. The parts are passed from machine to machine, with no WIP in between. I love seeing examples of other people's lean activities. Doing something yourself is always the best way to learn. After fighting through the problems, you end up intimately familiar with what works and what doesn't. But seeing other lean successes is a great way to expand beyond your own environment. And it's incredibly easy to critique someone else! Why did this manufacturer decide to use three machines instead of one? Using simple math, if the entire process takes 15 minutes, the throughput for a one machine set-up is 15 minutes per part. For three machines, the throughput is 5 minutes per part. I've made a few comments below, but watch the video first. How is this work cell lean? Depending on the customer demand, we may have to increase takt time to meet production. In this case, we're dealing with with general purpose equipment - machining centres - where we typically do not want to run to takt time. The equipment is expensive and can be used to run other product, so by running fast and focusing on quick die changes, we can make maximum use of the equipment. Secondly, by dividing up the work load between three machines, the cell becomes flexible. Need more parts? Maximize output and run with four people. Or reduce your throughput by running with 1 person! You can speed up or slow down the cell when the customer demand fluctuates. Finally, lean is all about respect for people. A person should never have to wait for a dumb machine. I'm not sure how autonomous these machining centres are, but loading a part, cycling the machine and waiting for the machine to finish is a waste of resources. By splitting the work between machines, a single operator can be working at one machine while the other is running (if possible). What do you think? Is this a waste of capital equipment or an efficient lean work cell? 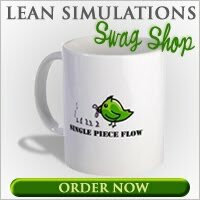 I've added this video to my massive list of free lean training videos.